Ahmed, Y., Gbeminiyi, S. (2019). On The Transient Combustion Analysis of Iron Micro-particles in a Gaseous Oxidizing Medium Using Variation of Parameter Method. Reliability Engineering and Resilience, 1(1), 1-11. Yinusa Amoo Ahmed; Sobamowo M Gbeminiyi. "On The Transient Combustion Analysis of Iron Micro-particles in a Gaseous Oxidizing Medium Using Variation of Parameter Method". 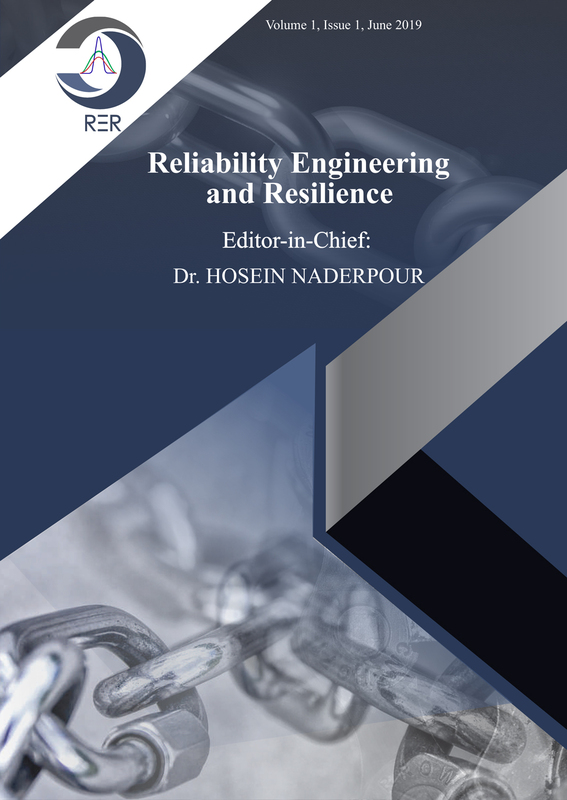 Reliability Engineering and Resilience, 1, 1, 2019, 1-11. Ahmed, Y., Gbeminiyi, S. (2019). 'On The Transient Combustion Analysis of Iron Micro-particles in a Gaseous Oxidizing Medium Using Variation of Parameter Method', Reliability Engineering and Resilience, 1(1), pp. 1-11. Ahmed, Y., Gbeminiyi, S. On The Transient Combustion Analysis of Iron Micro-particles in a Gaseous Oxidizing Medium Using Variation of Parameter Method. Reliability Engineering and Resilience, 2019; 1(1): 1-11. Iron micro-particles when eject to the atmosphere from industries, factory and production enterprises pollute the atmosphere and generally affect the respiratory system. This paper presents a solution to such transient problem analytically by employing Variation of Parameter Method (VPM). For proper understanding of the problem chemistry and associated time of burning, the parameters involved are meticulously studied. The radiation property of the iron particle at high temperature as well as the impact of this temperature level on density are considered by incorporating radiation and linear micro particles density variation in the governing model. The obtained exact solution using VPM is verified with Runge-Kutta and also compared with the results of other works. Furthermore, error analysis is performed and discussed. The obtained result shows how the surrounding temperature and the heat realization term continue to influence combustible temperature history until an asymptotic behaviour is attained. It is envisaged that the present study will gain application in trying to annul some of the challenges the industries and firms have to overcome on combustion of solid combustibles like iron particles and also in the optimization of different particles burning time. Factories and industries have been faced with the demerits associated with metallic combustibles like iron dust and also the challenges involve in predicting the burning time of the combustibles in question. The explosion hazards associated with micro and nano combustibles need serious attention so as to make different industrial operations applaudable. Consequently, researchers have attempted to better understand and model the particle combustion phenomenon. One of the attempt include the recent study of Sun et al. . In their work, they carried out an investigation on the possible output when iron micro-particles are heated and suspended in air simultaneously. They made a conclusion on the possible range of combustion of the combustibles without phase flame by employing photomicrographs. The information gathered from the photomicrographs were then used to generate a relationship between the combustion period of iron micro-particles and diameter. Haghiri and Bidbadi  studied the dynamics of two phase mixture using the law of propagation of flame and accounted for thermal radiation. The mixture used includes iron micro dust and air. The result of their work shows that once the thermal radiation is augmented, particle burning speed and vaporization are exponentially enhanced. The work further shows the consideration of thermal radiation parameters when adequately considered compared with the case where this effect is correspondingly neglected. An examination was carried out by Hertzberg et al. on the explosion limits of combustible micro-metallic when temperature and pressure are critically varied from the ambient condition. Argument were also presented on how the research can benefit industries that are directly affected by the research scope. Meanwhile, after the combustible dusts have been properly modelled, there is always need to solve the obtained nonlinear transient model in order to visualize and predict the thermal behaviour of the combustibles in question. As a result of the aforementioned, different analytical schemes have been adopted to obtain exact solution to the nonlinear model. An interesting attempt to solve the nonlinear model was presented by Hatami et al. . They applied three different method of weighted residual and verified the results numerically. It was concluded that least square method displays better predictions as it agrees perfectly with numerical. However, in their work, no close form solution was obtained with all the parameters preserved. He [5–9] used perturbation method (HPM) to analyze and solve different nonlinear equations as applied to mathematics and engineering. He also shows ways of augmenting the scheme to handle strongly nonlinear engineering and mathematical problems. Other interesting approximate analytical methods such as HPM , DTM [11–13] have also been employed to investigate heat transfer in porous longitudinal fin as well as in convective heat transfer analysis considering internal heat generation. Sobamowo et al. did a further study by considering fin with similar characteristics but with internal heat generation that is temperature-dependent and with the inclusion of a magnetic field. They presented interesting results and an elaborate parametric studies. The efficiency of the fin analyzed was also depicted and discussed. The obtained results using HPM were finally verified and a good agreement was established. In an attempt to obtain exact solution to partial differential equations, Yaseen et al. solved the Laplace equation analytically by using DJ method. They considered different boundary conditions and also compared the obtained results with those of previous studies. Sobamowo and Yinusa [16,17] adopted the Adomian decomposition method and DJ method to study the thermal and environmental behaviour associated with combustible metallic micro-particles in an oxidizing medium. Furthermore, Yinusa and Sobamowo  did a recent study on the analysis of dynamic behaviour of a tensioned Carbon nanotube in thermal and pressurized environments. In their work, integral transform was employed to obtain the dynamic behaviour and stability criteria of the carbon nanotube. Nur et al. carried out an elementary investigation on the influence of tea dust geometry and sizeon its explosion by considering some food particles . Motivated by the previous works, this work introduces an approximate analytical scheme for generating and monitoring combustibles temperature history during and after burning, so VPM is applied. The method agrees excellently with numerical Forth order Runge–Kutta and other methods with minimal error as compared to those of previous works; hence the verification of the schemes. Consider a spherical shaped iron micro-particle as presented in Fig. 1. The iron dust has the capability to combust when in high reaction with an oxidizer. Fig. 1. Schematic of combusted iron particle in gaseous media . R is the remainder of the linear operator of order less than L.
Nf represents the nonlinear terms. is the multiplier that reduces the order of the integration and can be determined using Wronskian technique. The verification of the analytical method used (VPM) with a numerical Runge-Kutta is depicted in Fig. 2. The scheme, VPM ascertain a very close agreement with numerical method. In order to visualize the accuracy of the scheme, a super-imposed plot which shows the temperature profile of a 20μm combusting iron particle is inspected as displayed in Fig. 2 and also Table 1. From the figure, it is evident that VPM agrees excellently with the Numerical scheme and as such is efficient for the problem in concern. Fig. 2. Verification of VPM with Numerical. Fig. 3 and Fig. 4 depict the influence of combusting particle diameter on temperature profile and burning rate using VPM. From the graphs, it is shown that particle diameters have evident influence on the temperature profile. A particle with 60μm diameter was observed to possess a higher temperature profile which means that increasing the combusting particle diameter causes a corresponding increase in the temperature profile and the burning time. As a result of this evident impact, the particle diameter may be used as a controlling agent in reducing the hazardous effects that normally propagate from iron particle combustion. Fig. 3. Effect of particle diameter on the temperature Profile with DJM. Fig. 5 and Fig. 6 depict the influence of and on the temperature profile. From the figures, it can be seen that increasing and decreases the combustion temperature with this effect more pronounced with . The decrease in combustion temperature with a corresponding increase in and is as a result of an increase in the radiation heat transfer term in the combustion particle. Fig. 5. Effect of on the temperature profile. Fig. 6. Effect of on the temperature profile. Fig. 7 and Fig. 8 display the impact of the heat realization term and the temperature of the surrounding on the combustion temperature. From the plots, it can be concluded that that increasing the heat realization term and the temperature of the surrounding increases the combustion temperature. This increase is significant for the heat realization term variation than that of the surrounding temperatures except for high values of surrounding temperature. The physical implication of the combined increase in both components result in micro dusts of very high temperature and latent energy which when inhale may be hazardous. As a result, it is very important to release such combustibles only into properly controlled or monitored domain. Fig. 7. Effect of heat realized term on the temperature profile. Fig. 8. Effect of surrounding temperature on the temperature profile. Table. 1. Comparism of the analytical scheme with a numerical method for a 20μm iron particle. In this work, a study has been carried out for the determination of the temperature history of iron particle during combustion process. The results of the VPM solution were verified numerically. It was established that VPM gives a good result and is efficient for the problem investigated. Also, parametric studies were performed to fully understand how the combusting particle diameter, density, radiative term, heat realized term and other parameters affect the burning time as well as the combustion temperature. The results revealed that by increasing the heat realized parameter, combustion temperature increased until a steady state was reached. It was also achieved that particle diameter have evident influence on the temperature profile. A particle with 60μm diameter was observed to possess a higher temperature profile which means that an increase in the combusting particle diameter causes a corresponding increase in the temperature profile as well as the burning time. As a result of this evident impact, the particle diameter may be used as a controlling agent in reducing the hazardous effects that normally propagate from iron particle combustion. It is hoped that the present study will enhance the understanding of the combustion of the particle and also obviate the challenges facing industries on combustion of metallic particles such as iron particles as well as in the determination of different particles burning time. SUN J-H, DOBASHI R, HIRANO T. Combustion Behavior of Iron Particles Suspended in Air. Combust Sci Technol 2000;150:99–114. doi:10.1080/00102200008952119. Haghiri A, Bidabadi M. Dynamic behavior of particles across flame propagation through micro-iron dust cloud with thermal radiation effect. Fuel 2011;90:2413–21. doi:10.1016/j.fuel.2011.03.032. Hertzberg M, Zlochower IA, Cashdollar KL. Metal dust combustion: Explosion limits, pressures, and temperatures. Symp Combust 1992;24:1827–35. doi:10.1016/S0082-0784(06)80214-6. Hatami M, Ganji DD, Jafaryar M, Farkhadnia F. Transient combustion analysis for iron micro-particles in a gaseous media by weighted residual methods (WRMs). Case Stud Therm Eng 2014;4:24–31. doi:10.1016/j.csite.2014.06.003. He J-H. Homotopy perturbation technique. Comput Methods Appl Mech Eng 1999;178:257–62. doi:10.1016/S0045-7825(99)00018-3. HE J-H. ADDENDUM: NEW INTERPRETATION OF HOMOTOPY PERTURBATION METHOD. Int J Mod Phys B 2006;20:2561–8. doi:10.1142/S0217979206034819. He J-H. A coupling method of a homotopy technique and a perturbation technique for non-linear problems. Int J Non Linear Mech 2000;35:37–43. doi:10.1016/S0020-7462(98)00085-7. HE J-H. SOME ASYMPTOTIC METHODS FOR STRONGLY NONLINEAR EQUATIONS. Int J Mod Phys B 2006;20:1141–99. doi:10.1142/S0217979206033796. HE J-H. A NEW PERTURBATION TECHNIQUE WHICH IS ALSO VALID FOR LARGE PARAMETERS. J Sound Vib 2000;229:1257–63. doi:10.1006/jsvi.1999.2509. Saedodin S, Shahbabaei M. Thermal Analysis of Natural Convection in Porous Fins with Homotopy Perturbation Method (HPM). Arab J Sci Eng 2013;38:2227–31. doi:10.1007/s13369-013-0581-6. Darvishi MT, Gorla R, Khani F, Aziz A. Thermal performance of a porus radial fin with natural convection and radiative heat losses. Therm Sci 2015;19:669–78. doi:10.2298/TSCI120619149D. Moradi A, Hayat T, Alsaedi A. Convection-radiation thermal analysis of triangular porous fins with temperature-dependent thermal conductivity by DTM. Energy Convers Manag 2014;77:70–7. doi:10.1016/j.enconman.2013.09.016. Hoshyar H, Ganji DD, Abbasi M. Determination of Temperature Distribution for Porous Fin with Temperature-Dependent Heat Generation by Homotopy Analysis Method. J Appl Mech Eng 2015;04. doi:10.4172/2168-9873.1000153. Sobamowo G, Adeleye O, Yinusa A. Analysis of convective-radiative porous fin With temperature-dependent internal heat Generation and magnetic field using Homotopy Perturbation method. J Comput Appl Mech 2017;12:127–45. Yaseen M, Samraiz M, Naheed S. Exact solutions of Laplace equation by DJ method. Results Phys 2013;3:38–40. doi:10.1016/j.rinp.2013.01.001. Sobamowo GM, Yinusa A. Transient Combustion Analysis for Iron Micro-Particles in a Gaseous Oxidizing Medium Using Adomian Decomposition Method. J Comput Eng Phys Model 2018;1:1–15. doi:10.22115/cepm.2018.122052.1012. Sobamowo GM, Yinusa AA. Transient Combustion Analysis of Iron Micro-Particles in a Gaseous Oxidizing Medium Using a New Iterative Method. J Comput Eng Math 2018;5:3–16. doi:10.14529/jcem180301. Yinusa A, Sobamowo G. Analysis of Dynamic Behaviour of a Tensioned Carbon Nanotube in Thermal and Pressurized Environments. Karbala Int J Mod Sci 2019;5. doi:10.33640/2405-609X.1015. Nur Hikmah S, Siti Zubaidah S, Noor Sabrina AM, Siti Kholijah AM, Rohaida CM, Shalyda MS, et al. Preliminary study on the tea dust explosion: the effect of tea dust size. MATEC Web Conf 2019;255:02014. doi:10.1051/matecconf/201925502014.